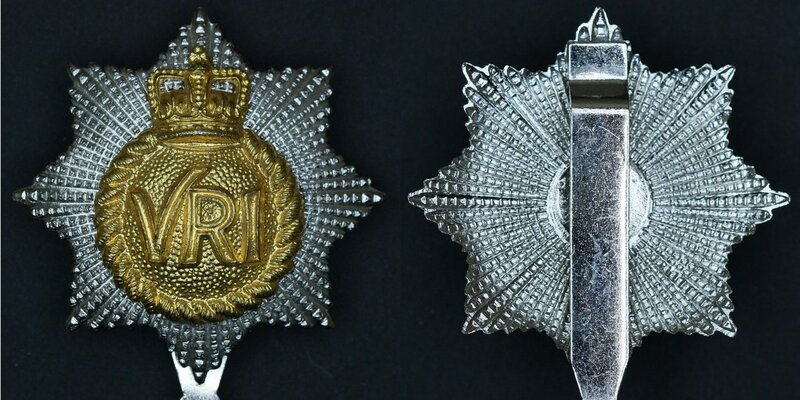 These badges were issued during the 1980s, and show the change of the backplate from the stamped version of the previous decades to a somewhat more finely detailed variation of highly convex stars with deeply incised radial and concentric lines. These badges have a wide-based Imperial crown on a stamped front piece with raised edged block letters in the cypher. Versions of these badges can be found with the "VRI" painted in. This was done by officers in the Regiment to create an officer's variation. 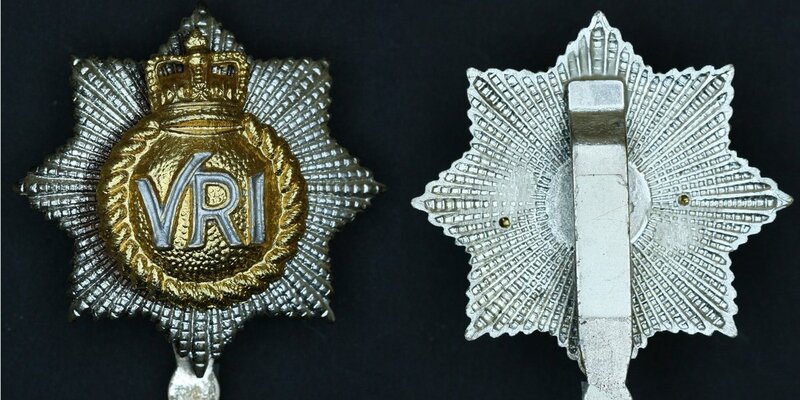 There were no badges produced of these editions with silver lettering, and as young officers were instructed to correct their badges, this would make the painted copies a recognized "official" variant. This requested change to the diamond cut star evidenced itself in the 1980s, perhaps as existing stocks were depleted and refreshed with a new order of badges. These badges also had a highly convex profile, more so than any previous badges, and very distinctly different from the officer's badge the diamond cut star was to follow: "The back plate on the Officers' cap badge is aluminum alloy and flat in construction, ..." (RCR Museum document package 14-4767-1883, letter dated 18 Mar 1971). The first such badges with the diamond cut star retained the cypher and crown of their immediate predecessors. It was not until the 1990s that a new front piece came into service. 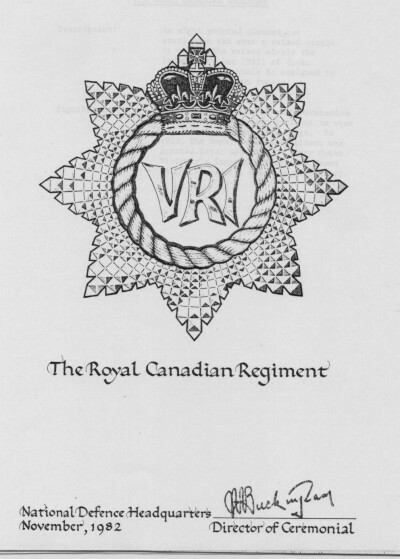 In November 1982, a new drawing of the Regimental badge was authorized by the signature of N.A. Buckingham, Director of Ceremonial at National Defence Headquarters. Description: An eight pointed diamond cut star; upon the star a raised circle Or within the raised circle the Imperial Cypher (VRI) of Queen Victoria. The whole is ensigned by the Imperial Crown proper. Significance: In 1894 Queen Victoria gave permission for The Royal Canadian Regiment to wear her Imperial Cypher as a badge. 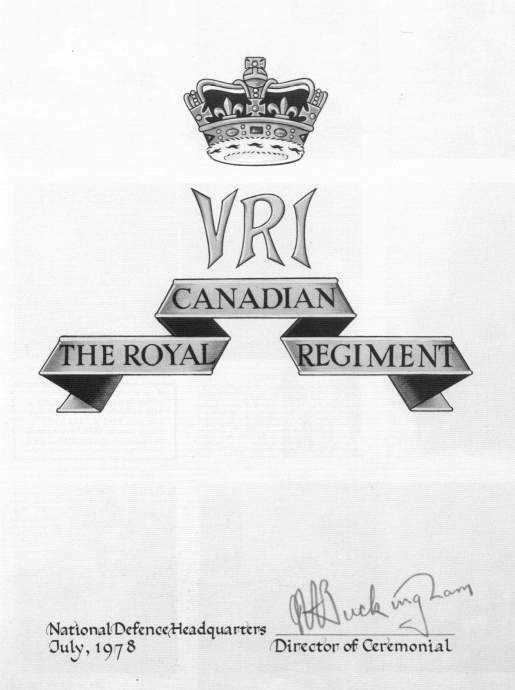 In1919, The Royal Canadian Regiment was granted Royal approval to carry Queen Victoria's Imperial Cypher and Crown on the Regimental Badge in perpetuity.